A cover with a rare opportunity to see a ‘real’ puffin alongside Fat Puffin. Coverage of the Great Puffin 5th Birthday Exhibition. 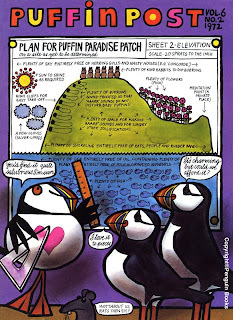 A call to all Puffineers (members) from Kaye Webb to help raise £3000 to buy a stretch of coastline as a Puffin reserve. I add that this was achieved and is still there! If you want to visit, it is part of the RSPB reserve on Bempton Cliffs. 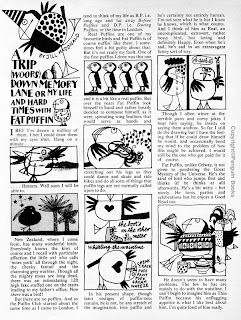 Here’s a nice little article that Jill McDonald wrote about the creation of Fat Puffin – it’s a shame that there aren’t similar articles for Odway and TOMCAT. A bit of a wash and brush up!! Kim on Calling all ex Puffineers! Jessica Norrie on Calling all ex Puffineers! Rakondite on Calling all ex Puffineers! Gemma on Calling all ex Puffineers!